Starting from the customer target, iMAb generates and transfers (with full ownership) functional human antibody leads for the customer’s drug development program. iMab’s technology is based on proprietary humanized synthetic antibody libraries and highly innovative, flexible and robust display technology, especially fitted for challenging targets. In vitro display technologies, brewing for years in the academic environment, have recently been unleashed from patent restrictions allowing iMAb to make its optimal use for the rapid generation of antibodies virtually against any target of any type (peptides, proteins, whole cells) and with high control over the antibodies selected. 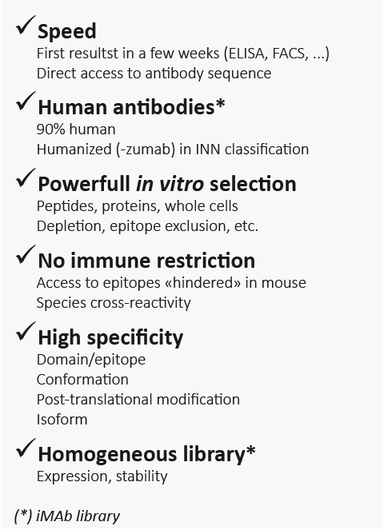 Unique advantages offered by this technology over the traditional hybridoma approach includes: the ability to define specific selection conditions allowing the derivation of antibodies recognizing predefined epitopes or conformations, the immediate availability of genes encoding the selected antibodies, and their further improvement (e.g. affinity maturation, engineered developability). Furthermore, the starting naive antibody library can already be made human (no more humanization needed) and selections can be designed to obtain species cross-reactive antibodies (eg. mouse-human) allowing better assessment of therapeutic efficacy and toxicity in animal models. iMAb has obtained from Inserm the license for using two proprietary highly optimized phage display libraries of humanized antibodies, one devoted to hapten targets, the other to protein and peptide targets, in both scFv and Fab format. These libraries have been very successful in generating antibody leads for numerous challenging targets. "Our scaffold: a key structural element for homogeneous high expression and stability"
Our libraries are based on a single optimized scaffold reaching remarkably high levels of expression and stability. Furthermore, the library diversity on this framework has been carefully designed to retain these properties resulting in collections of selected antibodies with homogeneous high expression and stability. 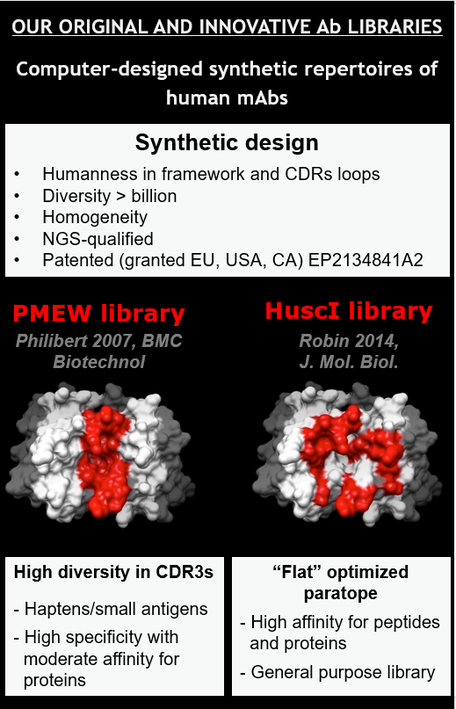 "An optimized library for stability, affinity, and epitope coverage"
Through extensive bioinformatics analysis of hundreds of antibody-antigens crystal structures and model structures integrating the hyper-stable scaffold, key positions and residues were identified to optimize diversity for stability, affinity, and epitope coverage. The human scaffold, diversification and hypervariable loop lengths variations are consistent with human antibodies. Therefore all antibodies from our libraries, which reach a diversity of 3-10 billion, are humanized (-zumab) according to INN classification. Besides the library, key to successful antibody recovery is clearly dependent on the process and screening protocols adopted to fit the projects specificities. Over the years, we developed a robust toolbox for antigen preparation, a broad range of selection schemes including pH dependent antibody selections, scFv-Fab-mAb rapid reformating, screening, and numerous characterizations to validate and assess developability. Our in-depth knowledge of phage display and scientific expertise in antigen preparation, assay development, and screening protocols, has resulted in successful delivery in all our projects.